The 2019 edition of Mobile Congress has yet again seen record levels of attendees and once again apple tree has been at the heart of delivering an incredible experience. 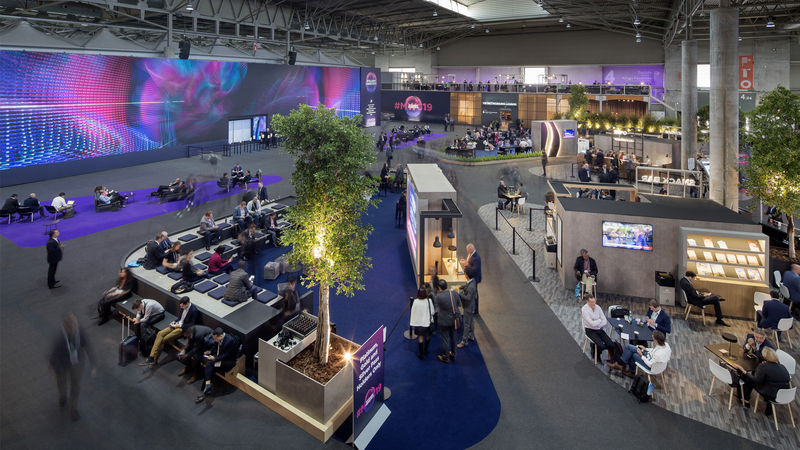 In addition to creating and managing the NexTech Theatres, 6 auditoriums with networking areas, delivering sessions for 36 different clients over 4 days, this year our role centred on reinventing the entire MWC Conference experience. For the first time ever the GSMA decided to open up the exclusive conference area, Hall 4, to all attendees whilst maintaining access to sessions exclusively for top pass holders. The MWC conference programme is one of the most prestigious technology conferences in the world and a chance to hear keynote speakers that are truly shaping our mobile future. However, there was nothing breakthrough or surprising about the format and it was time to change that. apple tree completely redesigned the stage sets and created a spectacular main stage that featured the largest, high resolution LED screen ever used in Spain. This 30-metre-long screen dominated the room and was used to create dramatic transitions and opening effects. apple tree managed the development of animated content and an incredible laser and light show that received cheers and applause from the suit wearing attendees (a first for MWC). It is always amazing to see the culmination of months of planning and preparation when MWC week comes around, even if there is rarely time to take a step back to admire the spectacle. Over the four days, apple tree managed more than 600 speakers in a programme which included the first ever 5G tele-mentored surgery, the prestigious GLOMO awards and the Women4Tech programme.